Lemon Cheesecake Parfaits are light with a zip of lemon, perfect for a spring dessert. Choose your favorite lemon cookie. 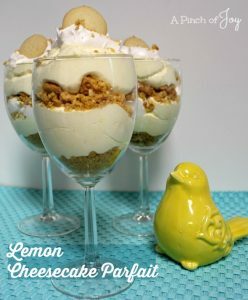 I usually use lemon wafers (next to the vanilla wafers on the grocery shelf), but the ones pictured have crushed lemon cream filled cookies layered through the parfait with a tiny lemon crisp on top. Any lemon cookie will work as long as it is crisp enough to crumble. The number you need will depend on the size of the cookie. I use sugar free lemon pudding which was a little hard to find. You can use regular instant pudding instead, especially if you are not concerned with “carb counts” as we are. Boost the flavor with some additional lemon juice or lemon flavoring. I made this two or three times before I realized it takes two 8 ounce containers of whipped topping. I could not figure out why the number of servings was always less than I expected! Duh! Be sure to fold in an entire 8 ounce container of topping into the cheesecake. You probably won’t use all of the second container for layering and topping. To layer the cheesecake into the glasses, start with a layer of crumbs on the bottom. Use a plastic zipper quart sized bag to squeeze the cheesecake mixture into the glass without smearing. 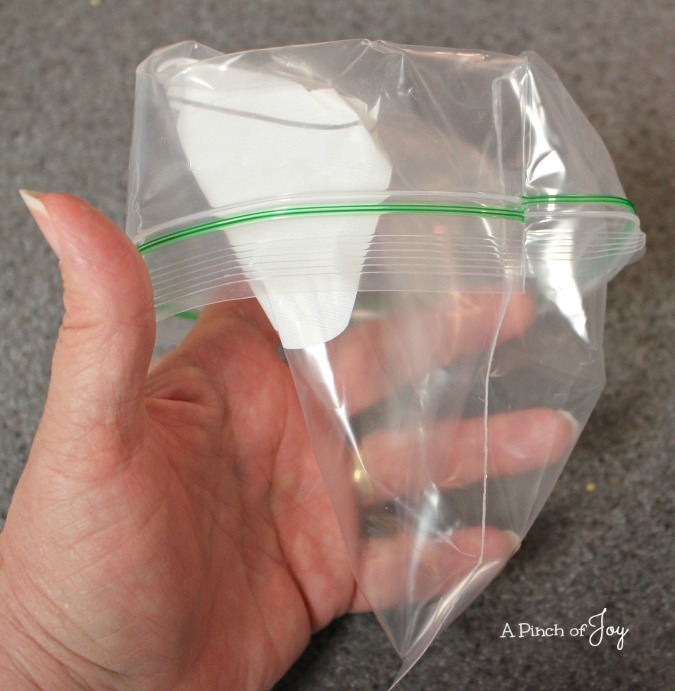 Pull down one corner of the bag, while pushing the the other side up to form a cone. Fold down the top of the bag to make it easier to load. Scoop the cheesecake mixture in, folding up the top to fill the bag. Zip bag closed, while still keeping the cone shape. Snip off the corner so the opening is about an inch in diameter. Squeeze gently into the parfait glass. Try not to touch the upper sides of the glass to avoid smearing. Crush the lemon cookies in a plastic zipper bag and set aside. Cream cream cheese, sugar and flavorings until smooth. Can substitute 1 packet lemon crystals or 1 tablespoon lemon juice for lemon flavoring, if desired. Add milk and pudding mix, beat until smooth and fluffy. 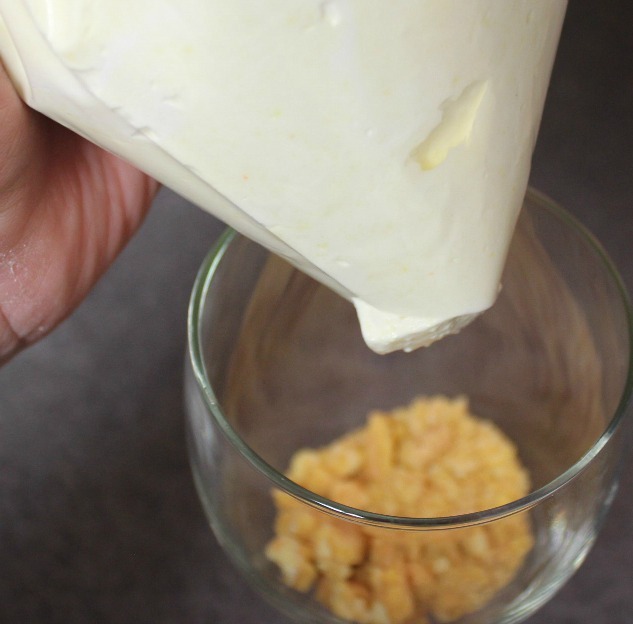 Fold in one 8 ounce container of the whipped topping. To make parfait, sprinkle cookie crumbs into bottom of glass. Add a layer of cheesecake, a layer of whipped topping. Repeat. Garnish top layer of topping with whole cookie and a few crumbs. Use any lemon cookie that is crisp enough to crumble, such as lemon filling cookies (such as Oreo), lemon wafers, lemon crisps. Number needed will depend on size of cookie, but generally 2-4 cookies per serving to crumble for layering, plus cookies for garnish. Oh, Im in for anything lemon. This looks easy to make for large groups.